Holidays are anticipated all year and are, of course, to be enjoyed with the people who matter most in your life: your family. This is why we search for destinations which cover all the requirements, demands and interests of each and every member of our family. 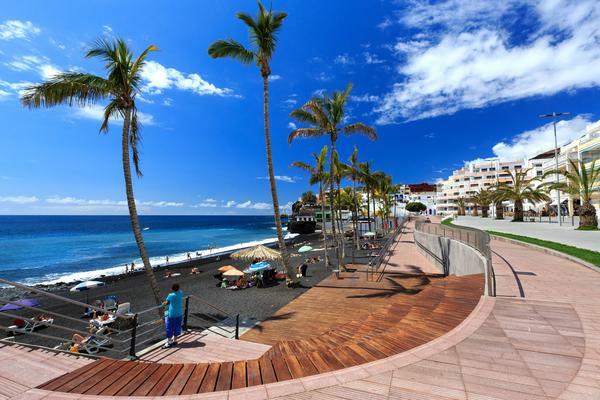 We want all of us to have fun together and have unforgettable moments on an adventure as a family – and La Palma is an ideal place for adults and children to have an adventurous holiday. Get the backpacks, hiking boots, trekking poles, hats, camera, water, food and appropriate clothing for a “jungle” excursion! One of these “jungles” is Cubo de la Galga (PR LP 5.1), in the municipality of Puntallana. Along motorway LP-1 going north, after passing the Galga neighbourhood and the tunnel after it, on the left you will find a cabin with a large car park. This is the start of the route. Two and a half hours of an easy difficulty level await you among the ferns and laurel forest. Look to one side and the other, comparing the ferns and seeing which is the largest and most impressive. Another option, not far from here is part of the PR LP 6 from the Bosque de los Tilos forest Interpretation Centre to the Mirador del Espigón Atravesado viewpoint, of an easy difficulty level (no more than half an hour will lead us outwards, and another half an hour will bring us back). Located in the municipality of San Andrés y Sauces, you will also arrive first by the LP-1 motorway, just before the large bridge which leads to the urban centre you will clearly see the left turn. You can start to visit the Interpretation Centre and learn about the laurel forest, the laurel pigeon and the Bolle’s pigeon. 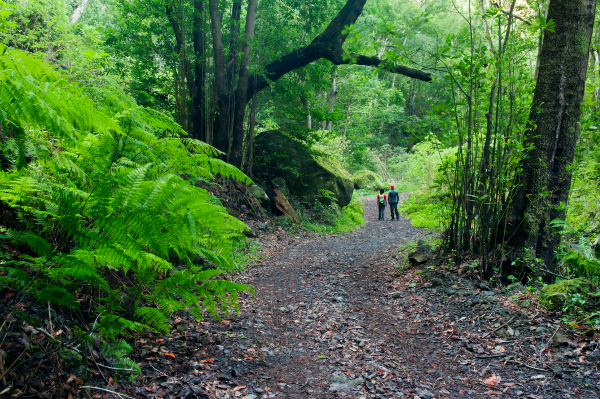 You will then begin the hike, entering the thickest, lushest greenery you have seen in your life. Searching for the favourite hiding places of goblins and elves, you will have the sensation that they are looking at you, making mischief, hidden under the large ferns. Finally, after the dense vegetation, opening before you is the clearing of the Mirador del Espigón Atravesado viewpoint, with the sensation that you are inside a cathedral of nature with a dome of sun and mountains. A third “jungle” awaits you further north. Following the LP 1 you will arrive at the municipality of Villa de Garafía, specifically at the archaeological park of la Zarza and la Zarcita. This is an obligatory visit for playing at deciphering the Benahoarita hyrpglyphics, those from the island’s first inhabitants. From here there is a hiking route, the PR LP 9.2 to Don Pedro, with Cruz del Gallo at half way. With a medium difficulty level, you will need two hours to hike in each direction. The impressive and beautiful feature of this hiking route is that you will enter the Sistine Chapel of the laurel forest. That’s right, you read that correctly. The works of Michelangelo are converted into beautiful trees and plants, all with unbelievable tones of green. Once at the bottom of the ravine, look upwards to admire the natural dome over your heads. Also in the municipality of Villa de Garafía, specifically in the neighbourhood of Tricias, near the square you will find the hiking signs that lead to Buracas, by the GR 130.1. With an easy difficulty level, the hike lasts one and a half hours in each direction. When you reach the impressive dragon tree, walk under them and simply look up and you will feel tiny. 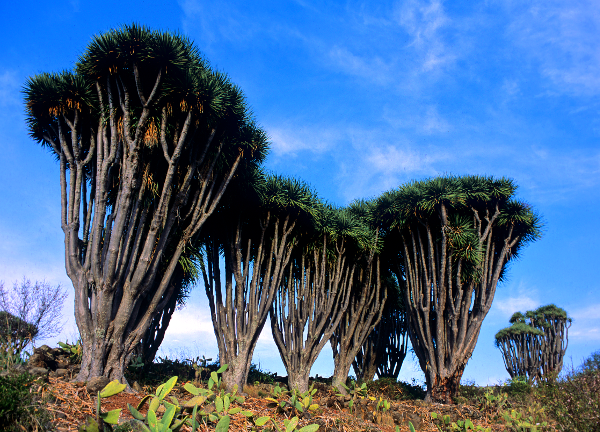 Continue the hike to see who can find the most beautiful, most elegant dragon tree. On the way back, make a stop at the Gofio Interpretation Centre, in the unique windmill which houses it. You will learn more about this food which is so important in the island diet. On a volcanic island you cannot miss out on walking between volcanoes, treading on each volcanic rock and leaving your footprint on the terrain so that the heat and energy of the volcanoes accompanies you. 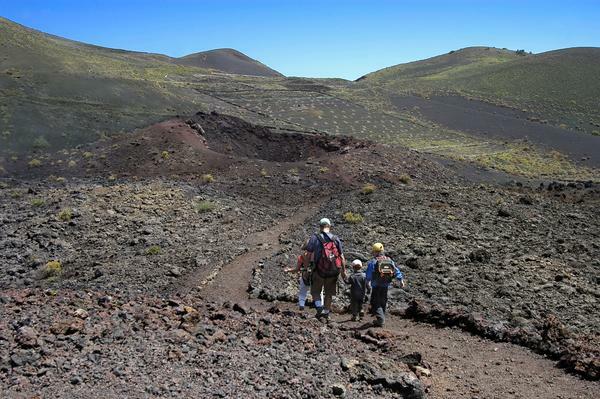 The route can begin at the San Antonio Volcano Visitor Centre, in the south, in Fuencaliente. A visit to the centre will bring you closer to volcanology and allow you to walk through the crater of this volcano, enjoying fantastic views. Continue down towards Teneguía, the last volcano (on the surface) in Spain. A photo with the volcano in the background, a photo walking around the volcano, a photo of the mouth of the volcano; photos and more photos to immortalise this adventure. We can continue towards the coast, on a route which lasts a total of 2.5 hours of a medium difficulty level (descending the whole time) and which will give you the incomparable backdrop of the salt flats, the sea and the lighthouse for your fun and races through this hiking route. There is a view in La Palma which is unique and which you must not miss: the view of the Caldera de Taburiente from the Mirador de la Cumbrecita viewpoint. You will have the impression of being inside a crater, enjoying its pine trees, its peaks; marvellous. Have you ever been to a multi-adventure park? It is really fun. 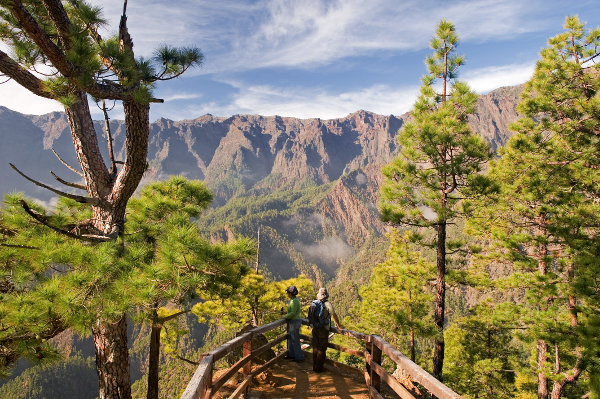 It has a series of attractions, such as zip-lines, Burma bridges, ladders, etc., which will allow you to have great fun among the Canarian pines. All aboard, the dolphins and flying fish are waiting! In the Port of Tazacorte, on the west of the island, appealing boats await you to take you along the west coast to enjoy it and the “owners” of the territory: dolphins, flying fish and whales which will delight you with their movements and jumps, accompanying you as loyal guardians on your adventure. You will have fun, with expressions such as “look, look, I saw one on the right” and “here, here, they’re coming this way”. There are also canoes for you which will give you the view of the Fuencaliente coast. All together, take the oars and row. 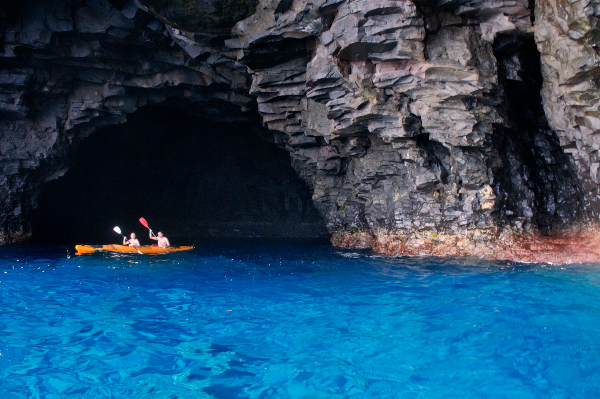 You will love feeling the pleasant freshness of the waves on your face and the “wows” of entering caves along the coast. La Palma has a network of bicycle routes for all levels, ranging from easy to difficult. We propose a simple but beautiful route: La Hilera de la Cumbre, the point which divides the island in two and which allows you to see the east on one side and the west on the other. At the end, there is the majestic Caldera de Taburiente. So put your helmet on and travel the route in single file. There is another pleasant option by bicycle: the recreation area between Pared Vieja and the Tunnel, a pleasant bicycle ride among vegetation. You will enjoy seeing the botany in the open air as a family. Finally, you will enjoy a well-deserved picnic at the beginning of the route, one of the most beautiful and complete recreation areas of the island. 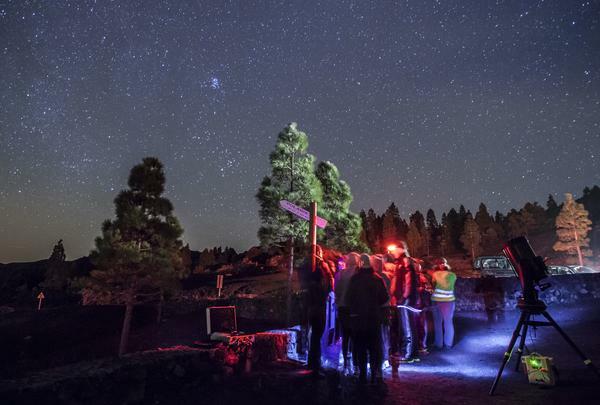 At night in La Palma you must look to the sky. You will be amazed by the number of stars that you can see and can also contract the services of a specialised company, making the experience so complete that you will feel like a true astronomer. The sky of La Palma is the best astronomic encyclopaedia for your children and yourself. 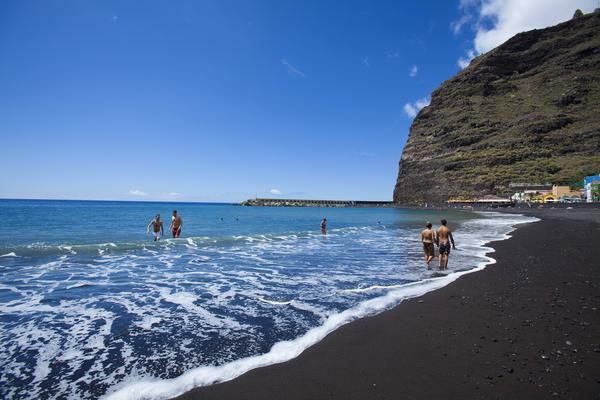 Don’t miss out on anything: make castles of black sand, splash around in the water, study the sea floor with goggles and a snorkel, and enjoy the sun. There is nothing better than spending the day as a family at the beach.